The Bible is historically reliable and very specific, such as the Table of Nations in the tenth and eleventh chapters of Genesis. However, prophesy is both specific and hidden at times. It is a tricky thing for several reasons, including the idea that a prophet is always in the business of telling what is going to happen in the far future. If you study on it, the primary job of the prophet was to speak for the Lord, often calling people to repentance. There are short-term events that may be considered forth-telling, such as when Elisha told Naaman to dip himself in the Jordan seven times so his skin disease would be healed (2 Kings 5:14). Another specific prophesy was that the Messiah would be born in Bethlehem (Micah 5:2), but it wasn't apparent that this was Jesus until after the fact. I'm not talking about modern jaspers who call themselves "prophets" and commence to making false prophesies. No, this is about the real thing in the Word of God. Many of the long-term prophesies are veiled, and cannot be fully understood until the conditions are right. People have studied the prophetic and apocalyptic literature in Daniel, Revelation, and other books for a mighty long time. (Sometimes it seems like they're ready to have an O.K. Corral-type shoot-out over the meanings of passages. Settle down, boys, and remember we don't need to act like atheists, we're bought by the blood of the Savior, you savvy?) What is probably the prophesy with the longest term and gradual unveiling is the protoevangelium in Genesis 3:15, which was given shortly after the creation of everything, and the Fall of Man. This prophesy in the first book of the Bible has its ultimate fulfillment in the last book of the Bible. Private conversations between individuals have often turned the tide of history. Think of just one example: the secret meetings between Roosevelt and Churchill, settling the Allies’ war aims before the United States’ entry into World War II. We’d all be surprised if we knew how much our everyday lives are affected by conversations among powerful individuals at the highest levels of government and society. Yet the combination of all those conversations pales in comparison to a brief, tragic conversation that took place in a beautiful garden six thousand years ago. The conversation is recorded for us in Genesis 3. 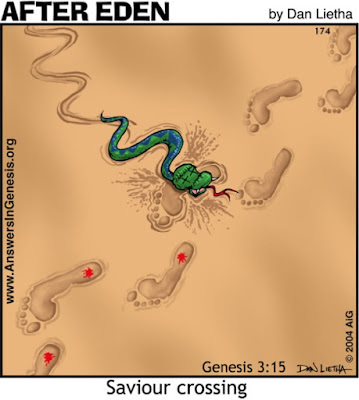 It was a dark episode in human history—involving a serpent, a woman, a man, and God. Yet from this scene shines forth the greatest beacon of hope the lost world has ever known. To finish reading, click on "Seed of Promise in Genesis 3:15". 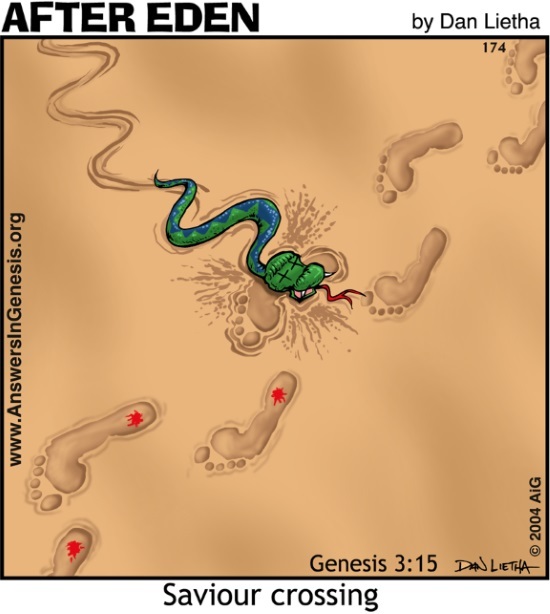 A second, shorter article also provides some interesting commentary, "Genesis Prophesies". ETWN is not Roman Catholic Enough?